I’m going to be doing a few posts this week about my maternal grandmother’s ancestry in honor of her. She has not been doing too well for the last few months and her condition has taken a turn for the worse this week. I visited her yesterday, possibly for the last time, so I thought I should honor her with a few posts about the people who came before her. Her maiden name, DeBroux (deh-broo), as far as we can tell at this point, hails mainly from Belgium. Though, Belgium itself has gone through a few “owners” throughout history (Netherlands, Spain, Austria, Burgundy.) By the time the earliest ancestor we have documented dates for, Jean Joseph Desire DeBroux, was born in 1830, Belgium had just gained independence from the Netherlands. The DeBroux family was mainly from the Walloon-Brabant region, which is a predominately French-speaking area. Also, based on the amount of DeBroux burials from the Walloon Region on BillionGraves, I may have a lot of cousins still living there. This same ancestor was the first DeBroux in our line to arrive in the United States, settling in central Wisconsin in the mid-to-late 1850s. 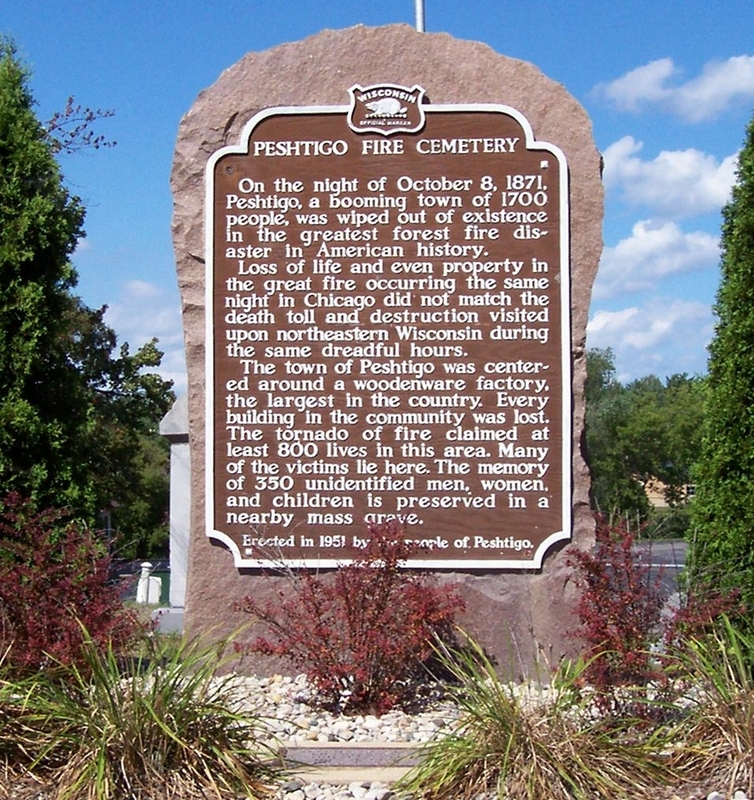 The family stayed in that area for a few generations before her father, my great-grandfather, Leon DeBroux, moved with his family to Port Washington, Ozaukee, Wisconsin in the 1920s presumably due to employment. Next post I will dig into another interesting line from her mother’s ancestry, the Van Price (van Parijs) line. For now, keep her in your thoughts. The twenty-third ancestor in my 52-week challenge is my wife’s maternal great-great-grandfather, Gustave Ferdinand Joseph GYRION. Gustave was born 24 January 1858 in the village of Warisoulx in the Walloon region of the Namur Province of Belgium. His parents were Casimir GYRION and Desiree CALONNE. Sometime around 1877 or 1879, he left Belgium and settled in Wisconsin. His first marriage was to a woman named Millie DeWitte in about 1880. Millie died not long after the marriage and Gustave married Josephine FRANCOIS in about 1889 in Outagamie County, Wisconsin. According to the note attached to the photo at the right, that is Gustave and his wife, Josephine, year unknown. It is also not known if Gustave always wore his hats on the side of his head, or if it was just a windy day. Throughout his life, Gustave worked in the paper industry as did a lot of other men in this area of central Wisconsin. In 1900 and 1905, he is listed as a general laborer at a paper mill. In 1910, he is listed as an Engineer, but no note of where he did this. In 1920, he is listed as an Oiler. According to Wikipedia, an oiler is a worker whose main job is to oil machinery. So, this was more than likely still related to the paper mill. 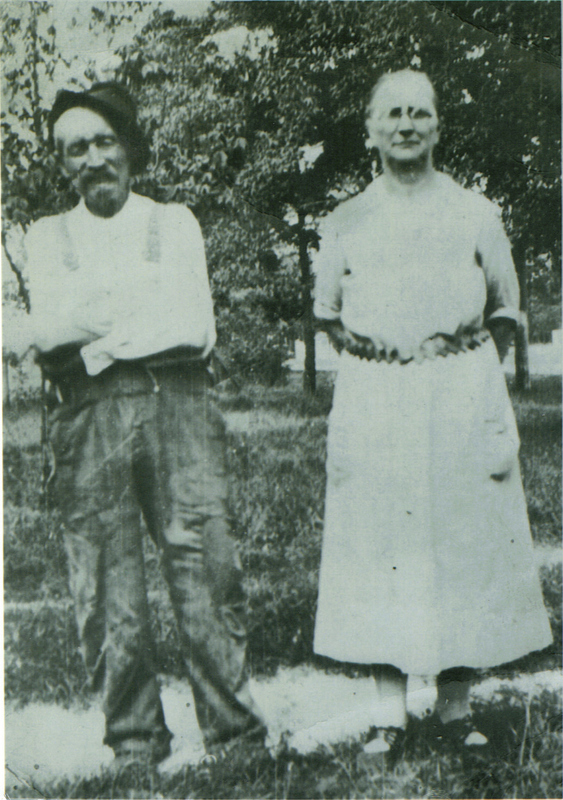 On 25 August 1934, Gustave passed away in Plover, Wisconsin, leaving his wife Josephine. He is buried nearby at the Plover Cemetery. This post is 23 of 52 in the “52 Ancestors in 52 Weeks” Challenge” begun by Amy Johnson Crow. The fifteenth ancestor is my 52 week challenge is my maternal 3rd-great-grandfather, Jean Joseph Desire DeBROUX. When I originally received the information on this family, it was only listed as Desire & Desiree DeBroux. That was the info I had for the longest time. They always caught my eye since it was such an interesting set of names. Later on, I found out that Desire was born Jean Joseph Desire DeBROUX on 16 February 1830 to Jean Joseph & Anne Catherine (LANGELE) DeBROUX. He was born in the small village of Piétrebais in the Walloon Brabant Province of Belgium. The next fact I have documented for Desire was his marriage to Desiree, also known as Marie Desiree LOOD, on 30 November 1854 in Piétrebais. They had their first child, Victorie Marie, in Piétrebais in 1855 before setting out for America in around 1857, settling in the center of the state of Wisconsin, mainly in the Outagamie County and Langlade County areas. My great-great grandfather Joseph Wilbert DeBROUX was born in Outagamie County in May 1865. Desire and Desiree passed away not too far apart from each other. Desire passed away on 6 April 1912 and Desiree on 19 November 1912 in the small Norwood Township in Langlade County, Wisconsin. They are both buried at St. Joseph’s Catholic Cemetery in that township. 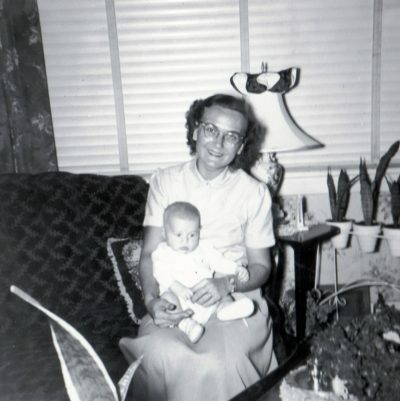 This post is 15 of 52 in the “52 Ancestors in 52 Weeks” Challenge” begun by Amy Johnson Crow. 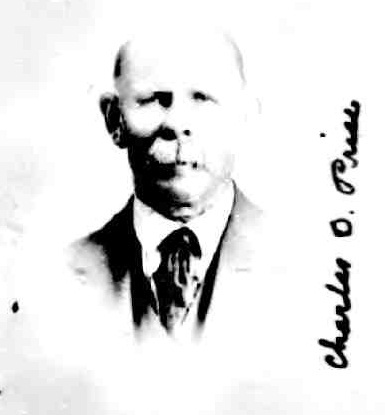 Charles Van Price was born in the early 1800s and came to U.S. in 1874. He traveled to Dousman, Wisconsin in Waukesha County. He worked for Mr. Dousman, later moved to Little Chute, Wisconsin, then to Phlox, Wisconsin in 1887. While staying with his daughter, Effie, in Waukesha, Wisconsin in 1922, he went grocery shopping for her and was never seen again. After investigating, it was assumed that he returned to Holland from Milwaukee. He sold his land earlier, and was now one of the wealthiest men in that part of the state. His daughter found he had withdrawn all his savings (a very sizeable amount) and probably left for Europe. 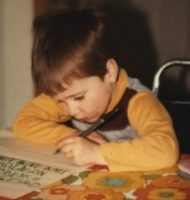 They traced him to Antwerp, Belgium — then all trace was gone. He was never heard from again. I tried to find any sort of trace of him in Belgium. Maybe he’s listed on a death record or a cemetery listing, but I never found anything. I was re-adding all of Charles’ census record information into my family tree, since I never actually put in the exact source info in the past, when I ran across a listing for a “Charles O. Price” in the Applications for US Passports database that closely matched him on Ancestry. There were actually two applications listed which looked to be a year apart, but they match pretty closely. 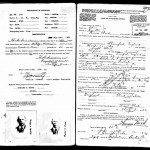 The first one says that he was born on June 6th, 1844 in Isendick, Holland. 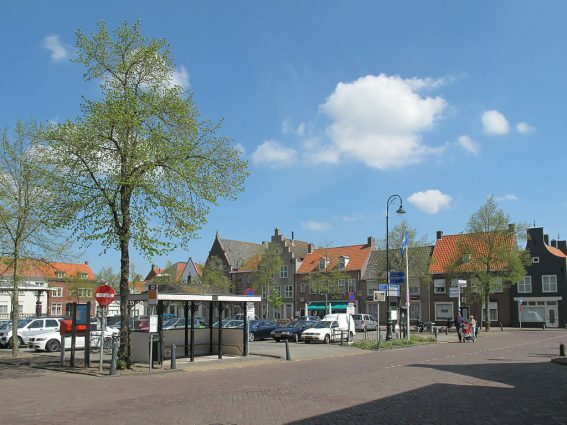 The information I have is July 6th, 1846 in IJzendijke, Netherlands (Holland) which is almost a match. It also says he lived most of his life in Phlox, Langlade Co., Wisconsin which is the area where Charles and his family did live. 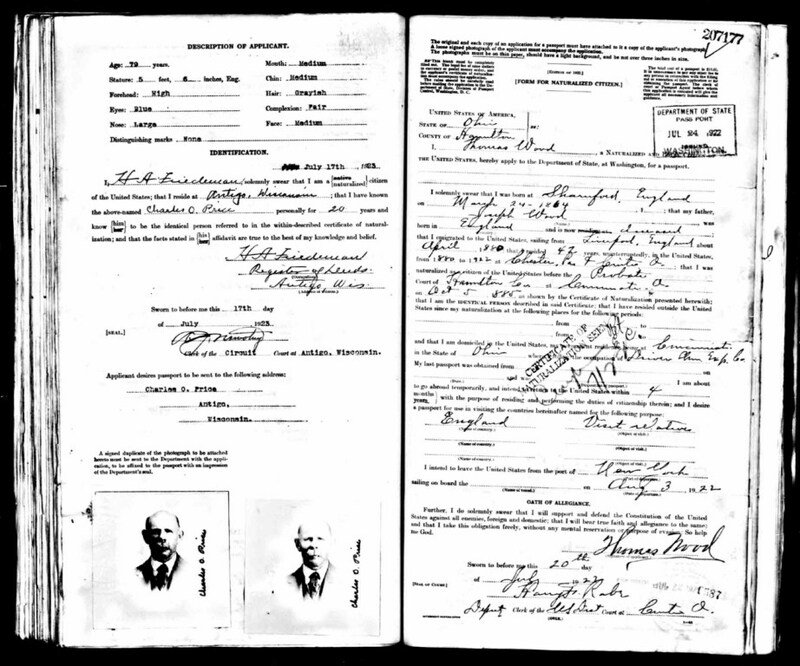 He mentions in the application that he is planning to go to the Netherlands to “visit my brothers” and that he will return in 3 months traveling on the boat, Finland, from New York on August 5th, 1922. What is odd is that there is a second application right after the first one for a Charles O. Price born on June 6th, 1844 in Izendag, Holland. This one lists Charles’ father as Jacob Price. That matches with me as I have his father as (his original name) Jacobus Bernardus VAN PARIJS. This one also notes that he lived in the Little Schute[sic] & Antigo, Wisconsin area which is also near Phlox. 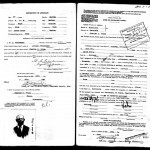 It also notes that he owns a previous passport which was obtained on July 24th, 1922 (the previously mentioned application.) Now, this application says that he intends to “visit my brother” in the Netherlands and stay for one year leaving from the port of New York. This one does not list a ship or a date. It almost seems like he didn’t actually go in 1922, or maybe that he went for 3 months and then went back in 1923 when this second application was made. Obviously, according to stories, never came back after that one. There are a few notable and even oddly humorous things on these applications. 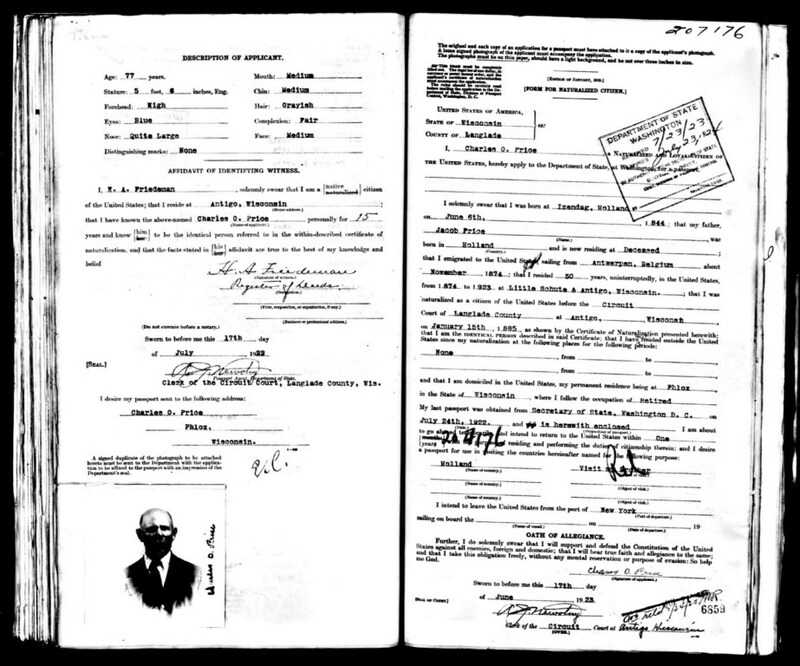 The first thing is that when describing Charles’ physical appearance, under “Nose” it says “Quite Large.” Also, how on both documents the birth places are completely different (at least in spelling), the immigration dates don’t match, and the living locations aren’t exactly the same. On both documents he uses a witness that has known Charles for awhile. H.A. Friedman swears that Charles is a good dude and that he should get a passport. In the first document in 1922, H.A. says that he, a “native” American, has known Charles for 15 years. In the second application in 1923, H.A. says that he, now a “naturalized” American, says that he has known Charles for 20 years. Great Scott! Has Charles invented the flux capacitor? Though, one wonderful thing about this document is that the applicant is required to attach a photo of themselves. 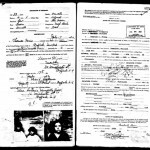 The first document’s photo is not very good, but the second one is much clearer and it is the first time that I’ve seen Charles. I’m not sure if my grandmother has ever seen a photo of her great-grandfather, so I’d love to show this to her. I still don’t know what happened to Charles after he arrived in Belgium or the Netherlands, but at least this does prove that he planned to go back. Maybe it makes more work. Oh well, isn’t that how Genealogy works? 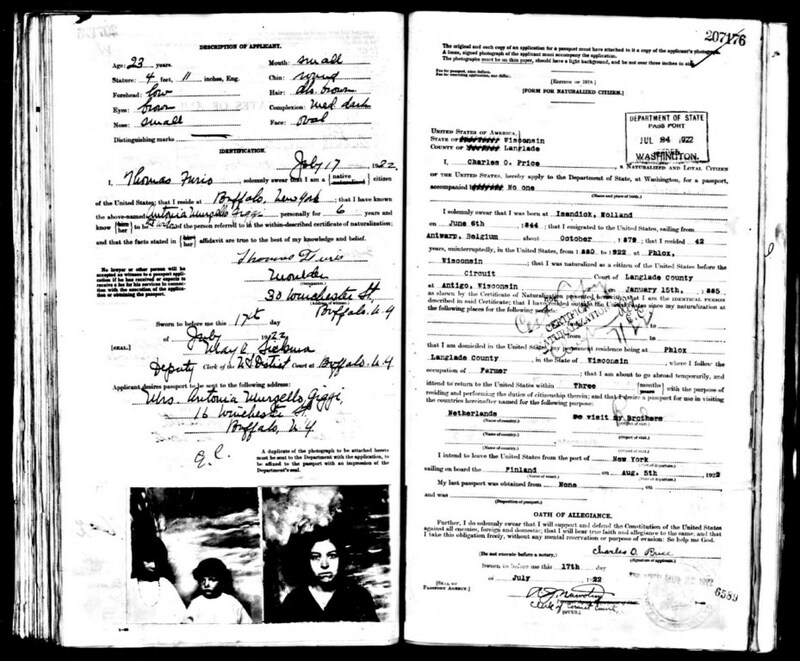 The two documents are shown below. Click for larger copies. The first half of the first page and last half of the end page are from other individuals, so please ignore them.